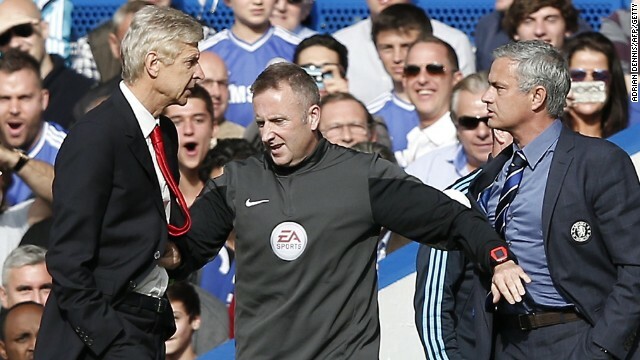 Arsene Wenger and Jose Mourinho have to be separated by fourth official Jonathon Moss in the EPL clash at Stamford Bridge. (CNN) -- Arsene Wenger and Jose Mourinho's uneasy relationship hit a new low as their ugly managerial spat overshadowed Chelsea's 2-0 win over Arsenal Sunday to extend its lead at the top of the English Premier League. The pair squared up to each other and had to be separated by the fourth official after Wenger shoved Mourinho in the Chelsea technical area. The Arsenal boss was angered by Gary Cahill's challenge on Alexis Sanchez but the pair's seething rivalry has been a constant theme in the English football soap opera. Back in March, Mourinho labeled Wenger a "specialist in failure" and then his side rubbed salt into the open wound by thrashing Arsenal 6-0. It was also Wenger's 1,000th game in charge of the Gunners and he has now failed to beat his Portuguese nemesis in 12 tries. After the touchline incident, Chelsea proceeded to take the lead through Eden Hazard's first-half penalty after he was fouled by Laurent Koscielny. Arsenal was always a factor in a closely-fought match at Stamford Bridge and might have had a penalty when former player Cesc Fabregas appeared to block Jack Wilshere's shot in the area in the second half. Fabregas, whose signing by Chelsea from Barcelona dismayed Arsenal fans who hoped he might return to the Emirates, then set up Diego Costa for the clinching goal. His pinpoint pass, his seventh assist in the EPL this season, left Costa to score his ninth in seven games since moving from Atletico Madrid, another key Mourinho signing. The win left Chelsea five points clear of Manchester City at the top, with Arsenal in eighth, already nine points adrift. Both manager tried to play down the incident in post-match press conferences. "Forget that (the push). A football pitch is a football pitch, so no problem," said Mourinho. "It becomes heated because this is a big game, big clubs, big rivals, an iportant match for both teams. These conditions make a game of emotions. Wenger was asked if he regretted the incident. "What is to regret after that? I wanted to go from A to B and somebody confronted me in between without any sign of welcome," said the Frenchman. "B was Sanchez, to see how badly he was injured," he claimed. Earlier, Manchester United moved up to fourth with a 2-1 win over Everton at Old Trafford, but owed a lot to the goalkeeping heroics of David De Gea, who saved a first half penalty from Leighton Baines. United were already ahead through Angel Di Maria, but the visitors pulled level when Steven Naismith scored in the 55th minute. Colombian star Radamel Falcao put Louis Van Gaal's men ahead just after the hour with his first goal in English football before De Gea denied Leon Osman with a stunning save to preserve three points for his side. Tottenham Hotspur is up to sixth, level on points with United and Swansea, after a 1-0 win over their manager Mauricio Pochettino's former side Southampton. Christian Eriksen scored the only goal of the match at White Hart Lane in the first half. Ahead of the international break, Italian heavyweights Juventus and Roma played out a pulsating five-goal thriller in Turin. Both sides had won its opening five games in Serie A, but champion Juventus came out on top 3-2 thanks to a volleyed late winner from Leonardo Bonucci in the 86th minute. The first half saw a series questionable penalties for either side, the first two converted by Carlos Tevez for Juve and Francesco Totti for the visitors. Roma coach Rudi Garcia was sent to the stands for arguing the first penalty, but he would have been pleased to see Juan Iturbe put his side ahead on a breakaway in the 43rd minute. Juventus almost immediately drew level in first half injury time with another disputed penalty, put away by Tevez. The match looked headed for a draw until defender Bonucci proved an unlikely match winner, but there was still time for Alvaro Morata to clash with Roma defender Kostas Manolas and both were red-carded. European champions Real Madrid also scored a key victory Sunday, thumping Athletic Bilbao 5-0 in the Bernabeu, with Cristiano Ronaldo scoring a hat-trick and Karim Benzema adding a double. The win takes Real to within four points of leaders Barcelona after seven rounds of La Liga.